Home→Books→The Bookshelf→Why Should I Be First? This is Nancy’s first book. It’s the story of the amazing “turnaround” of Chuck and Nancy’s 20 year Christian marriage which reveals the dynamic secret that released the power of God’s Love already resident in every believer. It’s a riveting, yet easy read. In this little book, Nancy intimately chronicles the failure of her own marriage and the Godly “key” that eventually turned it around. That key is learning the difference between God’s Love and human love and how to give everything over (even our hurts, fears, doubts, etc.) over to the Lord. He is the One who teaches us to love, not as “doormats” but wisely. Is your marriage relationship all that you want it to be? 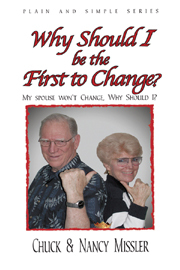 If not, Why Should I be the First to Change is just the book for you. Chapters in Why Should I Be The First To Change? God, What are You Doing to Me? Why Can’t He Change First? I can’t thank you enough for Why Should I be the First to Change? …it was so amazing – the anger was totally gone and I feel like a very different person now. I really do love him so much deeper than I ever did the 10 years before. I am sharing your book with girlfriends who struggle with their husbands. Thanks again Nancy! You are a “marriage saver”! Learn more about “Why Should I Be The First To Change?” with these supporting materials. Please indicate below the emails to which you want to send this article: Why Should I Be First? want to find out if the book is in CD. No, the download is a PDF. It is also available as a Kindle e-book, or the hard-copy. Does “Why Should I Be The First To Change” come in spanish?